Being kind to and looking after our bodies sometimes doesn’t come naturally. I feel like I’ve spent most of my adult life learning how to treat my body and myself with the same love and respect that I would treat a friend. I have lived through sickness and had many appointments in the doctor’s surgery, to-ing and fro-ing between specialists, getting this test or that and doing endless research to try and find answers, ultimately being forced to take of myself. I recently became aware of an imbalance between my body and my mind which yoga is helping to bring my attention to as I practice restoring balance. Here’s what I’m learning about loving the body, in sickness and in health. My body says to my mind “I don’t trust you.” She is cautious because too many times my mind has ignored her. When she has been desperately in need of rest and my mind has made her keep DOING, when she has asked for water and my mind has neglected this thirst or when she has needed to be listened to and instead my mind has abused her with too much alcohol or other things so as to silence what the mind did not want to hear. “I’m sick!” my body cried on many occasions until finally my mind slowly started to listen. But here’s the thing, years after learning to take better care of my body, after abstaining from harmful substances like alcohol and eating lots of healthy foods, now my mind finds it hard to trust a body that is still sick. My mind says to her, “I don’t like what you’re telling me! I don’t trust you either. You don’t work properly, why can’t you just be normal? I’ve tried EVERYTHING when will it be enough?” The details of my particular illness aren’t what are most important as this same story could fit into many different labels of ill health. But part of my struggle has been coeliac disease, an auto immune condition whereby my body attacks itself when gluten is ingested. My mind is cautious because too many times, my body has attacked itself and caused pain, sickness, exhaustion. There are two valid sides to this dispute, to this disharmony, this distrust. And my spirit is caught in the middle between the two, trying to unite the decade long feud between a mind and a body that long to be whole. I am still working on it, little by little, day by day. It’s been 7 years since my coeliac diagnosis, and at least 10 years of very up and down health. But it has also been this long since I first found yoga, which has offered a way to unite mind, body and spirit. At first I just went to weekly class and enjoyed switching off on a Wednesday night during a stressful exam period at school. I dipped my toe in and out of the water for the years that followed until finally committing to a daily practice and then completing my teacher training. One particular part of yogic philosophy that has really started to help with this union of mind, body and spirit is ahimsa. Ahimsa is one of the yamas - which can be described as ethical code of conduct - making up Patanjali’s 8 Limbs of Yoga. Ahimsa means non-violence or non-harming. This of course extends to others but, perhaps, a more challenging part of ahimsa is practicing this same compassion and care on ourselves. When practicing non-violence towards ourselves, we need to take care of our bodies physical needs as well as our minds emotional needs, and of course the two are intrinsically linked. Non-violence is not merely confined to abstaining from causing physical harm but mental injury too. Ahimsa means not beating ourselves up with our own thoughts, examples of which could be I’m not good enough, I hate my body or I’m useless. These three things are all things I have said to myself when I am sick, when my body is in need of love and care but instead I have rejected her, abandoned her. I recently listened to Clarissa Pinkola Estés reading ‘The Joyous Body Myths & Stories of the Wild Women Archetype’ and it struck me deeply to hear her describing how it might be if you were to treat a dear friend the way you may treat yourself. I was horrified at the idea of saying any of these things to a friend in need. I would not tell them they were useless or be angry at them, I would ask kindly “what do you need, my love? How can I help you?” I would listen attentively then I would do what I could to meet those needs. The ways in which yoga has personally helped me treat myself like a loved friend and less like a sworn enemy is not only through the philosophy, which is all about union and non-violence, but also through the physical practice. 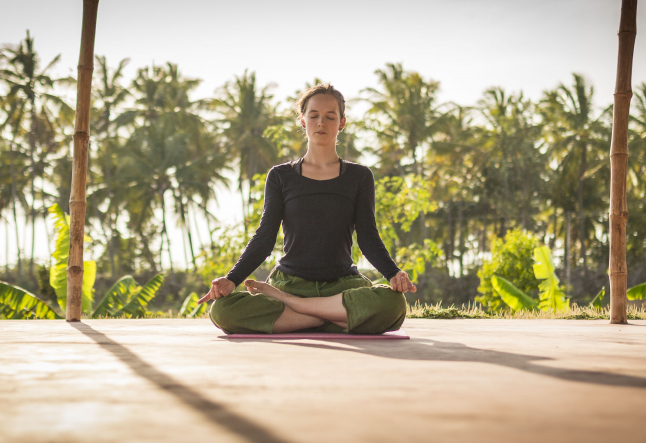 The physical practice itself is an embodiment of the philosophy and it is through my own daily yoga practice that I began to truly understand and feel into what this union of mind, body and spirit is (to truly understand and embody this union of mind, body and spirit) and how to practice ahimsa for myself. The sheer power of this very act is beyond words. Although I may not be able to find the right words to describe the profound effect that yoga practice has had on me, I can say that I have felt the benefits and that slowly, slowly, by practicing ahimsa little by little, day by day, my mind and body are beginning to learn to trust one another. This makes my spirit dance with joy.